Whilst the conventional mouse control allows you to perform any task that Premiere is capable of, for efficient workflow the keyboard shortcuts cannot be beaten. We all work a little differently, and thankfully Adobe understands that, so although here we will be concentrating on the standard keyboard layout, the keyboard shortcuts can be customized to be anything you want and saved as a custom profile, there are even presets already included for Avid Media Composer and Final Cut Pro for those who are maybe transitioning from those packages or just prefer the way they work. 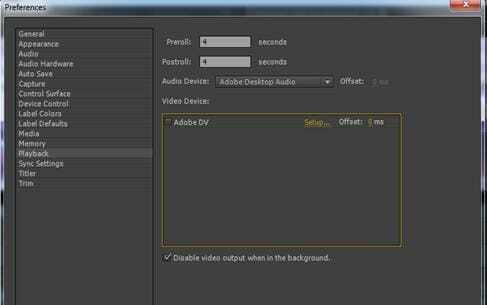 This is a basic tutorial about Adobe Premiere, professional video editing software. However, if video editing is new to you, consider Wondershare Filmora (originally Wondershare Video Editor), which is a powerful but easy-to-use tool for users just starting out. Download the free trial version below. Before we step into the most useful shortcuts, a brief note here on the different platforms, although I'm sure most readers are aware. The PC and Mac versions of the software do share the same basic shortcuts with the one caveat that where the PC uses the Control and Alt keys, the Mac has Command and Option keys instead. Other than that the functionality is the same. I'll include the shortcuts for both platforms with each to make referencing easier. I'm starting with this one simply because I find it the most used of all, especially if like me you prefer a custom layout for all your windows. If your program monitor is hidden for instance, you can just press shift+4 and there it is. The shortcuts are the same for both platforms here. 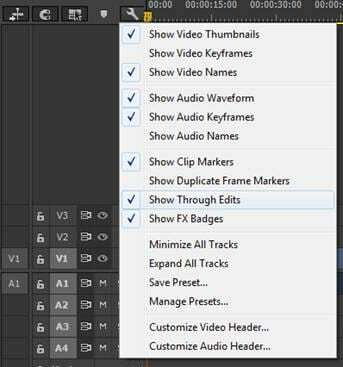 Whilst the shortcuts for editing and manipulating clips are extremely important for efficient workflow, it should be remembered that those relating to the basic operation of the program are just as useful, as we see here. Using Control and I (Command and I on Mac) brings up the import media dialogue box instantly. 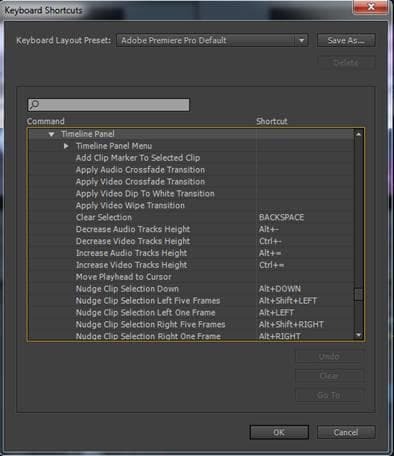 There are multiple shortcuts that can be used within the capture panel, but because this is such an intrinsic aspect of the Premiere workflow, being the entry into a project for all media, I think the available shortcuts are all as valuable as each other here. 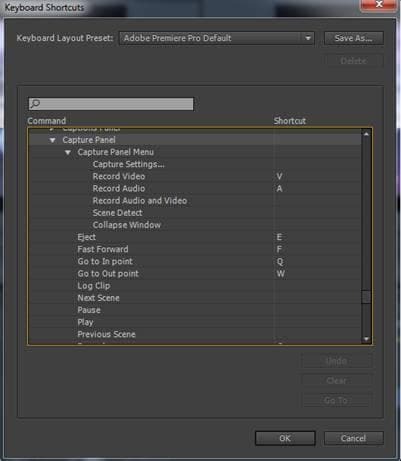 In a similar vein to the Capture Panel, the Timeline Panel has a set of shortcuts specific to all its basic operations, and are essential for a faster workflow. This one works within the program monitor/timeline or source monitor windows, ensure the desired one is active first of course. You can move to a specific time code within the clip, or go forwards or backwards a set number of frames using the number pad. To go to a specific time code simply type that on the number pad. To travel a set number of frames simply type + or – (to signify direction) and the number of frames. By far the simplest way to mark clips is to use the keyboard shortcut. For marking clips use X , whilst marking a selection is / . In addition to marking clips via shortcuts, it is also far easier to mark In and Out points this way. To Mark In use I , whilst to mark Out use O . To Clear In the shortcut is Control+Shift+I for PC and Option+I for Mac. To Clear Out Control+Shift+O for PC, Option+O for Mac. Play Around: The same for both platforms and is Shift+K. To get the best from this it is necessary to set some options beforehand, as Play Around plays the portion of the timeline around the Playhead, and where it plays is dependent on the options set. This is done through the menu via edit > preferences > playback, here I have preroll and postroll set to 4 seconds, meaning that it plays 4 seconds prior and following the point where the playhead is placed. In addition, turning on looping for this can help to fine tune edits. There are times you may want to hear audio when scrubbing, however turning it off can have beneficial effects on performance for lower end computers. The shortcut makes it an easy process to turn off and on as required. The shortcut is Shift+S for both platforms. There are a couple of options available here from the shortcuts, slide one frame or 5 frames. To slide one frame to the left is Alt+, for PC or Option+, for Mac. To increase to five frames add Shift to either shortcut. To slide one frame to the right is Alt+. for PC and Option+. for Mac. Again, to increase to five frames add Shift. As with the slide options, the choice is one frame or five frames. To slip one frame to the left is Control+Alt+Left for PC or Option+Command+Left for Mac. To increase to five frames add Shift to either shortcut. To slip one frame to the right is Control+Alt+Right for PC and Option+Command+Right for Mac. Again, to increase to five frames add Shift. You can move a clip up or down simply by using the Up and Down arrow keys, whilst holding Alt or Option at the same time allows you to select just the video or audio to move. This is a tool that allows you to work with multiple camera angles of the same subject or scene. To switch between different cameras quickly is extremely useful and accomplished with the numerical keys. Numbers 1 through 9 select the corresponding camera. This option cuts the track (or tracks) that are targeted. The shortcut for this is Control+K or Command+K. You can view all added edits within a sequence by selecting show through edits within the sequence menu. This option applies the default transition to all selected media. To do this use Shift+D. Locating a specific frame within the sequence for adding in a second clip is very useful, the shortcut is M, a great timesaver. 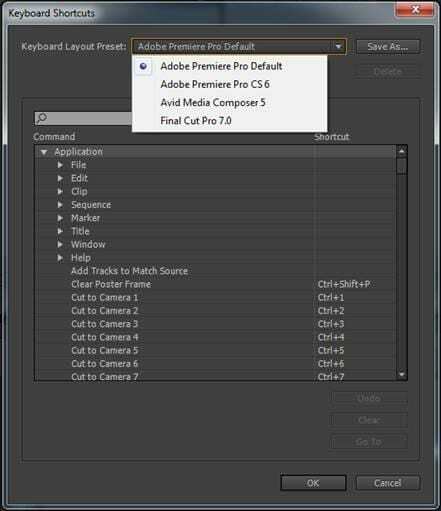 Navigating from edit to edit is a very simple process with the shortcuts available to you. Page up takes you to the previous edit point, whilst page down takes you to the next. With practice these shortcuts become second nature and you will find your workflow becomes not only faster but a smoother operation as well. Quickly shift between Standard, Ripple and Roll trim types. This enables you to trim the head or tail of the clip very quickly, making an extremely efficient workflow. To trim the next edit from the Playhead use W, for the previous edit from the playhead use Q.